Zip through the Garden ! 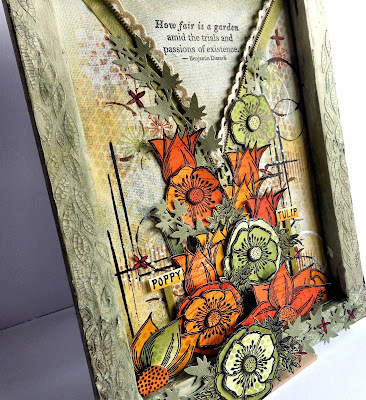 Join me for a fun day where you will create this shadow canvas project. There will be lots of layering, stencilling and even painting with your fingers ! We will also be using Fresco Finish paints as glazes over crackle paste and building a floral design using the new Lin Brown stamps from PaperArtsy, and yes there is zip through the centre of it ! You will need to bring an 11 inch zip (from top to bottom of fabric) in your chosen colour, all other materials included. Other items to bring are your heat gun, craft mat, scissors, apron and your lunch. 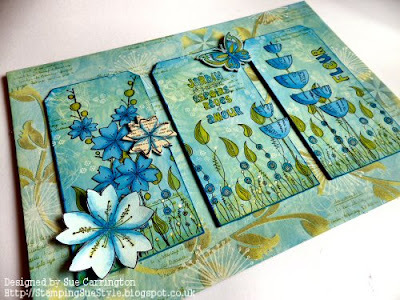 Join me for a fun day where we will be creating a canvas by layering up stencilling and stamping using PaperArtsy Fresco Finish Chalk Acrylic paints and stamps. Cost £35 for the day, 10AM -4PM. All materials are included, you just need to bring your heat gun, craft mat, apron and your lunch.